The Doctors announced that January was National Blood Donor month and they had their own blood drive happening with the American Red Cross. Dr Travis Stork visited the Red Cross donor bus outside in order to give blood, and while he was donating, he said it was obviously an important cause. He said he’s a big believer in donating blood, and although it’s the end of National Blood Donor month, it’s still important to donate all year. January has been National Blood Donor month since 1970 because winter is one of the most difficult times to collect blood. Each day, the Red Cross needs about 15,000 blood donations to meet the needs of patients, so the importance of donating is constant and saves lives. 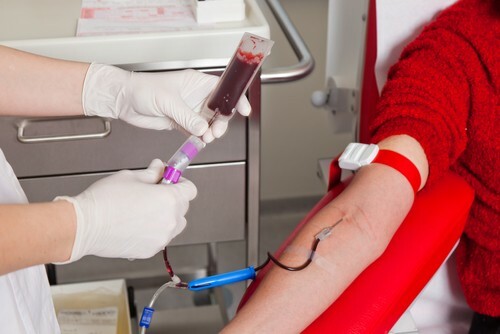 The number one reason people give for why they haven’t donated blood is that they haven’t been asked. “Consider yourself asked,” The Doctors said. Dr Stork was joined by Darrin Greenlee CEO of American Red Cross Southern California Blood Services Region, who shared that every two seconds someone in the United States needs a blood transfusion, so to keep up with that, the Red Cross alone as to collect 15,000 units of blood every day, equating to 5 million units a year. Dr Stork said that someone who has never donated blood before may not realize how easy the process is. He explained that he did a questionnaire earlier and checked his blood just to make sure everything was okay for him to be a donor. Darrin said the entire process takes about an hour, from the time you start your questionnaire to when they take the needle out of your arm and give you juice and cookies. The actual donation itself takes between four and seven minutes. He said one hour of your time can help save a lifetime. Because he works in the emergency department, Dr Stork said he’s truly seen how the gift of blood can give the gift of life. You’re eligible to give blood every eight weeks. Dr Stork was donating a pint of blood that day and Darrin joked that he would lose a pound today. Dr Stork said a lot of people are afraid of giving blood, so he’s hoping to soothe people’s fears. He suggested coming in to the donation center hydrated and after having a good meal, and of course continue drinking fluids afterward. He said to find a blood drive near you and save a life. Darrin told Dr Stork that his donation will save three lives because they will split the blood up in different components that can be used to treat different patients with different symptoms. Dr Rachael Ross said she wanted to keep the kindness going by sharing the #SMOCK of the week. A woman named Sara shared that she was driving to the grocery store and as she was pulling up there was a cute old man putting groceries into his trunk, so she stopped, put her blinker on and waited for him to leave. She realized as he walked over to the meter that maybe he wasn’t leaving. Then the man turned around and waved at her before getting into his car and leaving. It turns out that he had filled the meter for her, and she said she was so touched that she did the same thing when she left, filling the meter for the next person.